2019 OHL Priority Selection: Top 20 Prospects (and many honourable mentions) #2019OHLDraft - Very Barrie Colts | A website covering the Barrie Colts of the OHL. Shane Wright is a 2004 born player dominating the 2003 born circuit. Exceptional status must be on lock down for Wright, because another year of minor midget AAA would make no sense. He is the real deal and whatever team is lucky enough to draft him will likely get three years of his services (expect him to go to the NHL after his draft year). All the physical tools are there and his hockey IQ is next level. The way he sees the ice, distributes the puck, and attacks open gaps is impeccable. Watch out for the quick wrister mid-level and under the glove. That’s his go to move, but Wright has several tricks up his sleeve. I’ve seen him put the puck in the net almost any way imaginable. Sasha Pastujov had himself a tournament at the Silver Stick last weekend in Whitby. Him and Dylan Duke (see #5 on this list) had an incredible weekend and wowed those in attendance. 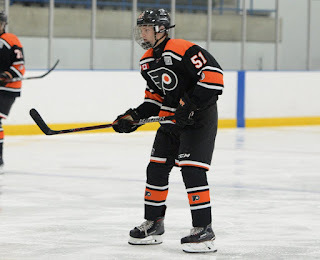 The finals with the Don Mills Flyers (5-4 OT win) was an absolute classic. Pastujov displayed a nice wrist shot that found the net frequently. He can change up his speed at the drop of a hat and stop on a dime. This kid can really play and his puck skills are special. Check out a goal by Pastujov (wearing #12) from the Silver Stick Tournament (assisted by #25 Dylan Duke) below. Brandt Clarke is going to make an OHL fan base very, very happy. The offensively gifted defenceman is oozing with skill and is very creative in the offensive zone. He can make all the fancy plays and it’s easy to see the similarities between him and his brother Graeme (forward for the Ottawa 67s). His stick handling and deceptive dekes are unmatched in this draft class. Clarke has incredible puck skills – he can make it disappear like he’s doing a magic trick when the opponent tries to take it off him. Clarke shows off his ability to dangle with a successful "Michigan Move" executed below. Duke can really motor and has excellent overall skating skills. He is undersized, but he has the speed and skill to be a big time star in the OHL. Duke and Sasha Pastujov (see #2 on this list) worked really well together at the Silver Stick. Duke is a fantastic playmaker, but he can also finish off plays as he regularly displays a nice scoring touch. Lockhart is a super skilled center from the Ottawa area. This kid has uber quick feet and a crazy good first step. He is the full offensive package with excellent moves, natural scoring talent, and excellent playmaking ability. Speed kills and Pinelli has it in spades. His hands keep up with his feet and he has made some moves that make my head spin. He will be a superstar in the OHL. Take a look at a fine example of his handy work below. Zhilkin was my favourite player in the bantam age group when he played with the Toronto Nationals. He made the move to the Marlies for his OHL Draft year and looks fantastic in the blue and white. He is really, really fast and tracks well at his top speed. Lots of talent here and he's the best player on the Marlies, who always have a juggernaut minor midget squad. Do you want the puck? Well, Liam Arnsby will go get it for you. I’ve seen Don Mills play a ton of games and I’m not sure I’ve ever seen him lose a 50/50 puck battle. He also throws vicious hits and has absolutely leveled and intimidated his opponents regularly. Not a fun guy to play against. He is very, very strong on the puck and leans real hard on his stick. There is a ton of offensive talent, but he plays in both zones really well. These types of pivots are special and he is about as complete as they come in this draft. Othmann is Shane Wright’s partner in crime. He is the perfect complement to Wright and they play extremely well together. Othmann is super sturdy and can bury the puck. His finishing touch is really high-end. Luke Hughes comes from royalty hockey prospect bloodlines. He is the brother of Quinn and Jack Hughes. He can really skate and Hughes is extremely smooth on the ice. His vision is really nice too and he has good playmaking skills. Right shot D with great playmaking skills. Sirizzotti can flat out score. The numbers he is putting up this season are insane. I’m at a loss for words at why I can’t rank him higher. Shut down D. The stats aren’t overly impressive, but they are decent. He plays a complete game and I’ve been very impressed by his style for a while now. He played up with the minor midget Marlies last season when they were short a defenceman. i agree on shane wright but will he go to Flint????? ?